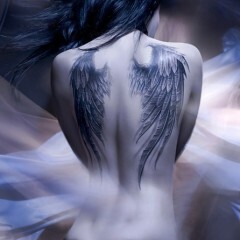 The small angel in this back tattoo has wings and is curled up with her head in her arms, resting on her drawn up knees. The girl in this photo has a tiny angel inked on her upper back, just under her neck and between her shoulder blades. The angel’s face isn’t visible, since she is curled up, but her wings are big and beautiful. 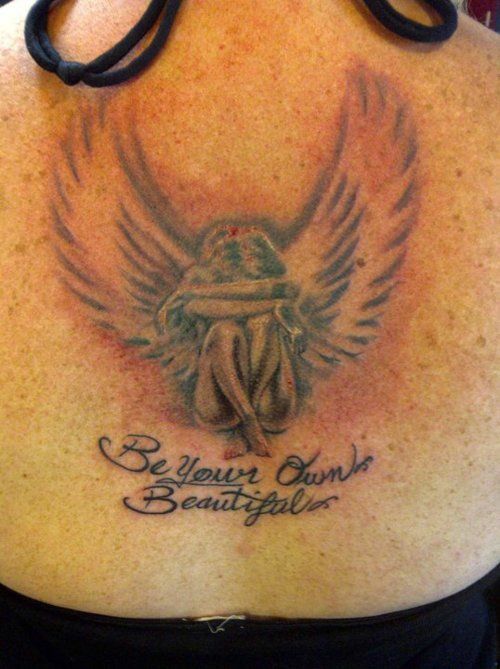 The tattoo is black and white and is accompanied by the text “Be Your Own Beautiful,” written beneath the tat. The curled up angel is a small image, but makes a powerful statement. 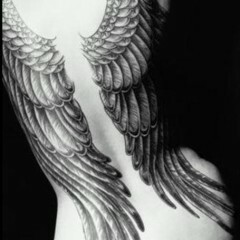 Angel tattoos are one of the most common kinds of tattoo designs, and are often inked in unique and distinctive ways. In most cases, angel tattoos hold a deep, personal meaning for the wearer, sometimes as a reminder of a lost family member or friend. 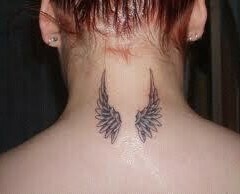 Angel tattoos are often found on the arm or back, and can range from small designs like this one, to full-size images that cover large portions of the body.